Firewater… paint remover… anesthetic… *(@%^+)&!!! It has been called a lot of names over the years. And, sometimes, justifiably. But in recent years, it has quietly experienced its own small revolution and, in some circles, it is now usurping the place of cognac as ‘the’ after-dinner drink of choice. It is grappa. Vancouver’s resident grappa expert is Giorgio Castiglioni, Area Manager of Focus Wines & Spirits, who agrees that grappa drinking was once only for those with iron-clad taste buds. Grappa is a spirit distilled from the skin and the grasp of the grape. And while the grappa-making process is quick and easy, creating a top-quality grappa takes great care. The process begins when newly-harvested grapes are placed in a de-grasper, which separates the fruit from the grasp. The fruit is pressed, either with a horizontal (or soft) press, which removes only the best juice; or with a vertical press, which removes all of the juice. After pressing, the remaining solids–the ‘vinacce’–go on to become grappa. 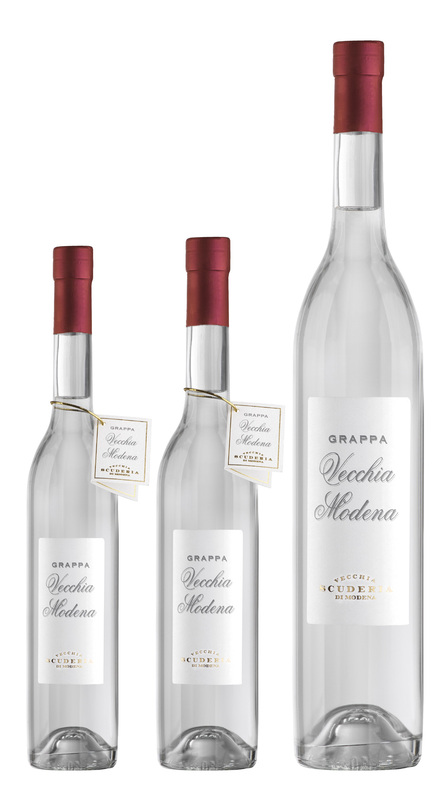 The distinction between best-quality grappa and lesser grappa lies with the vinacce. While the less discriminating grappa producer will use all post-pressing materials (including twigs), those distillers most concerned with quality will seek out the best grapes, then use only the very wet skin from soft-pressed grapes. After pressing, the grappa-maker has two styles from which to choose: continuous-cycle distilling, or discontinuous (artigiano) cycle. 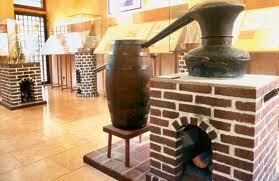 And both involve a grappa-making machine, or ‘alambiccho’, a complex, custom-made copper contraption of ancient origin. The continuous-cycle process uses the conveyor-belt system, wherein the solids automatically roll into the alambiccho and the grappa comes out the other end. With this method, up to 300,000 kg of vinacce may be processed daily. With the discontinuous-cycle method, small amounts of vinacce are placed manually in the alambiccho, the vinacce is distilled, the receptacles are emptied and cleaned and the alambiccho is filled again. With either method, the solids are processed via direct flame, boiling or steaming. But the discontinuous-cycle method is more selective, only 10,000 kg of vinacce is processed in one day, and the product is a much better grappa. The grappa-distilling process begins with the moist, spongy vinacce. As it is heated, the steam rises into a plated column, then into a filter, into a cooling system, and into another series of filters before being expelled as a liquid. The liquid then passes through a valve to remove the ‘head and tail’ deposits. As the alcohol is released at 78C, the resulting fresh grappa appears at 70% alcohol, so it is cut with distilled water to achieve the 40-43% drinking level. After that, nothing is added. The grappa is bottled and corked. As mentioned, the big difference between ‘industrial’ grappa and best-quality grappa is that the industrial-style distillers use any kind of vinacce–they don’t care where the grapes come from or how many grape varietals are involved. But in making best-quality grappa, distillers are very particular. They look for specific varietals of a specific quality. The best grappa is that which is bottled early. Young grappa, or Grappa Giovane (Pinot, Sarpa and Vespaiolo), is white and offers the strong primary aroma and flavour of the vinacce. 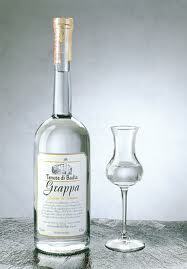 Grappa Affinata is aged for six to twelve months in wooden barrels and has a slightly woody flavour. The grappa Invecchiata, Stravecchia and Riserva are aged for a minimum of one year in barrels of different types of wood. These have more substance and a stronger, woody flavour and, after having absorbed the wood’s colour, turn yellow. They’re still good quality, but real grappa fans tend to go for the Grappa Giovane. 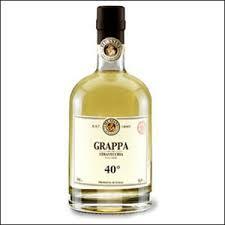 The word ‘grappa’ comes from the Latin ‘grappolus’, meaning ‘bunch of grapes’, and the beverage is distinctly Italian. All Italian regions produce grappa, but those best-known for their quality grappa are Veneto, Friuli, Piemonte, Emilia Romagna and Sicily. 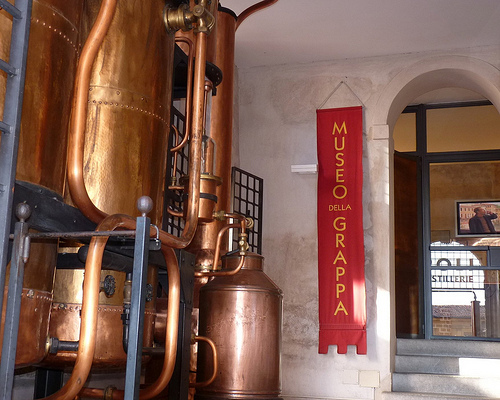 Grappa may not be a household term here but, in Italy, it has its own town and its own museum–the Museo Della Grappa in the Vicenza (Veneto) town of Bassano Del Grappa. Grappa came into existence in Medieval times, when the lords owned all of the land and, after the harvest, took the wine and left the peasants with the otherwise-wasted mush. It occurred to someone that the mush could be distilled. The alambiccho was invented, and enterprising grappa-makers began traveling from village to village with the portable alambiccho, distilling each family’s vinacce. More than a few people died in alambiccho explosions and the result was indeed fire water–almost 80% alcohol with, probably, a horrible flavour. ‘Course in those days, its main use was as a cure for stomach problems, as a disinfectant for cuts, and as dental anesthetic. Gradually, the quality of grappa improved with advances in technology but, up until the late 1960s, it was still a cheap local drink. Then grappa-makers started to experiment with new methods. They discovered, for example, that the vinacce must be fresh and wet–that you can’t just leave it to dry out in a barn until you get around to distilling it. Grappa is best when made on the day of the pressing, or the vinacce has to be refrigerated until the grappa can be made. “This is one of the reasons for the higher cost of grappa,” says Castiglioni. “To keep the vinacce fresh, it must be transported and stored in refrigerated compartments. Also, the quality distillers spend a lot of time in the fields during the harvest, carefully scrutinizing the quality of their vinacce to make sure that it is moist and wet. Then there’s the alambiccho–the modern alambiccho is an expensive custom-made piece of equipment with a very high hygiene factor. But one doesn’t consume grappa the way one would drink other spirits. Because of its strength and weight, grappa is usually consumed in the winter months. It is served at room temperature, or slightly chilled, and is appreciated as a digestive–often with coffee, always after a full meal. Grappa is also used liberally in Italian kitchens, as a spirited addition to roast lamb, veal scaloppini, pork tenderloin and sautéed prawns. It can be used in pasta sauces, in fish sauces, and to flambé fruit. And while it experiences its renaissance, it follows that the best Italian kitchens would be in on the grappa revolution. With a selection of 40 brands of grappa, Vancouver’s top Italian restaurant, Quattro on Fourth, has by far the city’s largest grappa selection. Quattro’s sommelier, Patrick Corsi, is enjoying the changing perception, and the ever-increasing popularity, of grappa. At Quattro, and at other fine Italian restaurants, grappa sales are way up. Many grappa brands are now privately imported and, due to growing demand, the BCLDB now offers 13 brands.